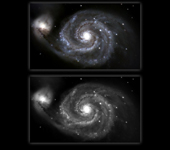 My best take on the Whirlpool galaxy M51. 2h 20min of light in 7 second exposures. My first supernova, 70 million light years distant. 5020s of light in 5 s exposures. out 2000 times the mass of the Sun and is about 1300 light years away. 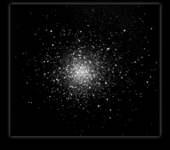 Messier 3 is a globular cluster of about 500,000 stars. It is estimated to be 8 billion years old. 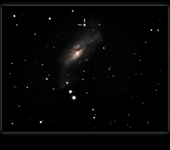 M3 is located at a distance of about 33900 light years away from Earth. 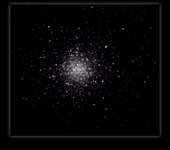 A globular cluster in the constellation of Coma Berenices. 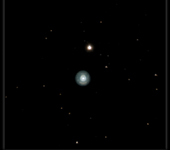 Planetary nebula located in the constellation of Gemini. 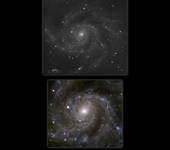 Messier 101 or Pinwheel Galaxy has an apparent magnitude of 7.86 and lies at a distance of 20.9 million light years from Earth. 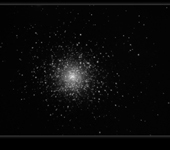 Messier 15 is a globular cluster containing over 100,000 stars. It is located in the constellation of Pegasus at a distance of about 33600 light years from Earth. Cat's Eye Nebula, a bright planetary nebula at the constellation of Draco. Distance: 3 262 light years. 9000 216ms exposures. Slightly better result with 669ms exposures. 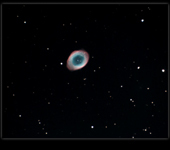 Messier 57 is a planetary nebula located in the constellation of Lyra. It is about 2300 light years from Earth. 1174 1s exposures.